We can’t end the HIV/AIDS crisis without ending it in the rural South.” That simple claim greets visitors to the HEROES LA website. Common sense would tell you that what the HIV-focused nonprofit in rural Louisiana states is true. But HEROES LA sought hard evidence as well. 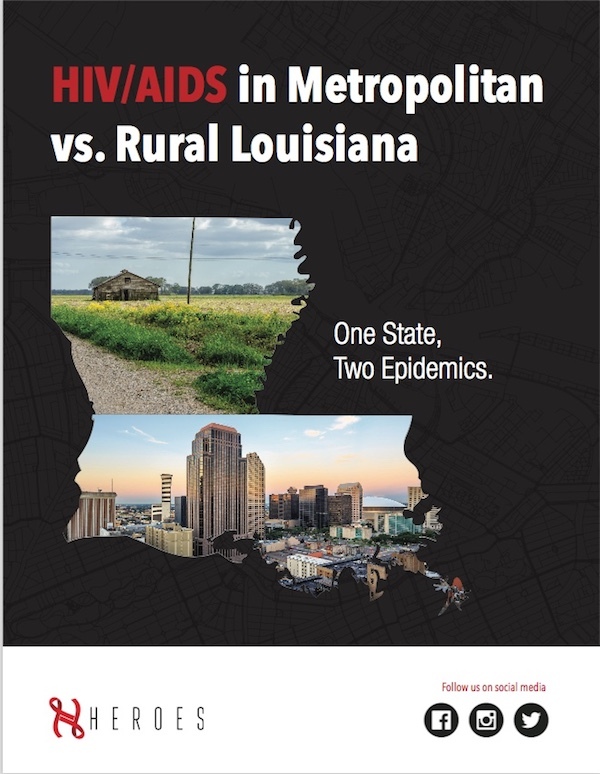 While evidence shows that Louisiana ranks first in the U.S. in new HIV infections, and fifteen percent of those are living in rural areas, how exactly do risk factors and access to resources shape the lives of individuals in areas outside of the major cities? A groundbreaking new report presents some answers, not only for Louisiana but the Deep South, as well. “HIV/AIDS in Metropolitan vs. Rural Louisiana: One State, Two Epidemics,” produced by HEROES LA, “compares risk factors for new infections, morbidity, late diagnosis, and other issues influencing the HIV/AIDS epidemic in the Louisiana population residing outside of major cities as a first step toward finding rural-appropriate solutions for Louisiana and deep South HIV patients.” A retrospective analysis of 2013–2016 data from the Louisiana Department of Health, among other sources, the report compares risk factors for HIV across state-designated regions: stigma, racial disparity, education, poverty, incarceration, and sexually transmitted disease (STD) rates. The report focused on Region 8, home to HEROES LA, as representative of the state’s predominantly nonmetropolitan, rural area; Regions 1 and 2, home to major cities like New Orleans and Baton Rouge, respectively, represented urban areas. While some risk factors were nearly similar, difference came to light. For example, Region 8 was found to have fewer HIV-related resources than Regions 1 and/or 2. Region 1 has eighteen testing sites while Region 8 has eleven (one choice for HIV testing within a 640-square mile area). Region 1 has eleven PrEP service sites; Region 8 has only one (within a nearly 7,044 square-mile area). Younger individuals ages thirteen to twenty-four are far more likely to test positive for HIV in rural areas. Individuals may become trapped by far distances and the intimacy of small communtiies. First, travel time in rural areas becomes a barrier to care, and the report strikingly shows that frequency of use when it comes to resources available is low compared to urban areas. Second, even if you live near a testing or treatment site, concerns about being stigmatized by providers and others may prevent or slow down individuals in need of services. Johnson states that, in a major city like Baton Rouge, someone could seek care at any number of service providers if they decided to go outside of their neighborhood for fear they might run into someone they know. Not really possible in rural areas, where you more than likely will know someone at the nearest accessible testing site. The lack of anonymity creates fear among individuals who may, in the end, defer testing or, if positive, resist seeking out treatment and support groups. 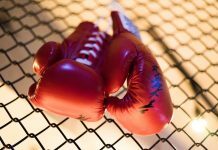 Though the report could not be conclusive about cause and effect, the combination of risk factors arguably has a greater negative effect on rural individuals than urban-dwelling ones. 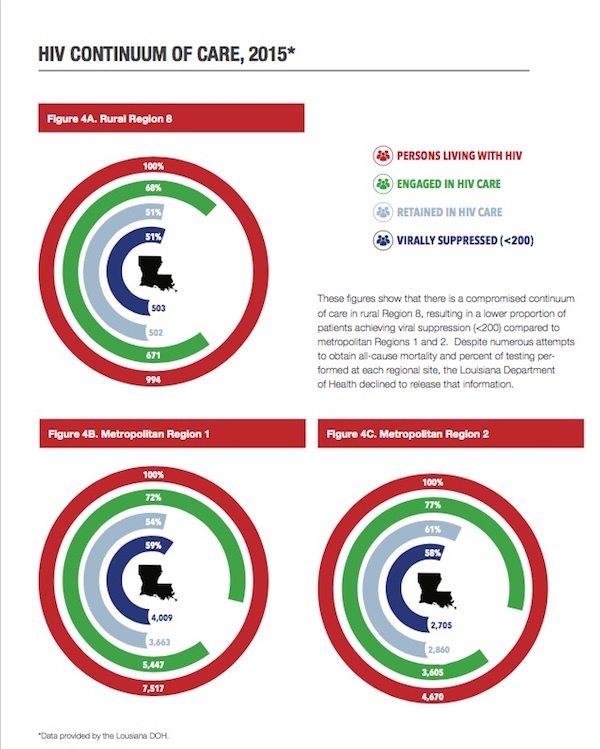 Fewer individuals living with HIV/AIDS in Region 8 are engaged in care, retained in care, and virally suppressed than in Regions 1 and 2. Among those who test late, individuals who are positive in Region 8 progress (or have already progressed) to an AIDS diagnosis at a higher rate than those in the urban regions. These risk factors are “combining into a perfect storm in the rural areas,” says Johnson, who has dedicated the past thirty plus years to HIV advocacy and is living with HIV herself. The size of the population of a city may mean little compared to the potency of the risk factors in the country. Thus, a rural area like Region 8 suffers when it comes to Ryan White disbursement, she notes. Region 8 does not have a large population to attract the same amount of funds as Regions 1 and 2, and so the dollars are stretched across a large area, devastated by HIV/AIDS. 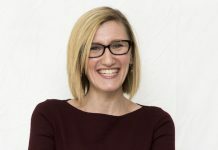 HEROES LA hopes the report will encourage others to find more finely tailored strategies and solutions for rural areas across the Deep South, as it is doing. Importantly, says Johnson, rural areas need a place at the table. Rural organizations and individuals who need their services should have a say about what works best for them. It is especially important, shares Johnson, because more customized approaches will produce better results—and better health outcomes. 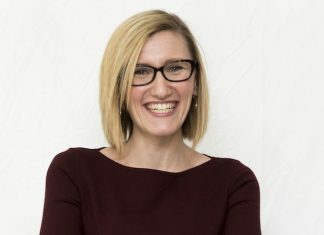 In her own area, Johnson advocates for the strengthening of linkages to care, for example, making sure that if an individual tests positive he or she can be immediately linked to care. If someone tests outside of a community-based organization (CBO), they are referred to a CBO but they have to navigate the system by themselves. Linkage to treatment would happen more efficiently at CBOs with access to rapid HIV testing, too. Mobile testing, says Johnson, may alleviate the pressures of stigma and shaming that keep individuals from staying on top of their health. Funding is much needed in rural areas. Former Governor Jindal cut prevention education funds. Other funding earmaked for the South has ended. HEROES LA used to hold its support groups at the local hospital—a safer, anonymous space—but Jindal privatized the charity hospitals and the new owners kicked them out. Now, Johnson tries to stay in touch with clients by phone to make sure they are taking their meds or not feeling too isolated. HEROES itself has been running on donations alone for more than a handful of years. For more information about the report and the work of HEROES LA, log on to: www.heroesla.org.